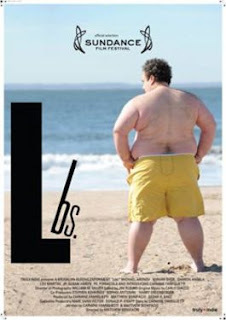 Fourth Row Center: Film Writings by Jason Bailey: In Theaters: "Lbs." I feel bad for not liking Lbs. more than I do—it clearly comes from a personal, genuine place, and the parties involved appear to have done some remarkable things in its preparation. But noble intentions alone do not a good picture make. You’ve also got to have a compelling structure, three-dimensional characters, and dialogue that viewers want to listen to; this film comes up short on all counts. Its heart is in the right place, but the execution is a nightmare. Co-writer, co-producer, and star Carmine Famiglietti plays Neil, a 300-plus pound substitute bus driver and compulsive overeater. His on-the-job heart attack causes his sister (Sharon Angela of The Sopranos) to postpone her wedding, and resentments among his family come to a boil when he resists his new diet and starts sneak-eating on the sly. When those tensions blow up at the do-over wedding, he takes drastic measure to drop some pounds: he purchases a trailer and a small plot of land out in the country, and removes himself from temptation. Lbs. has been making the festival rounds for five-plus years now, and sports a low-budget look and feel. This isn’t automatically a criticism (you’ll find no bigger Clerks fan than me), but some of the construction and composition by director Matthew Bonifacio is awfully amateurish. Ditto the broad playing of the supporting characters, the clunky sound design, and the pedestrian coverage (the film is shot and cut like a dull TV movie). More troublesome is the draggy pace—it’s a stagnant narrative with no momentum. Scene after scene (particularly in the first act) consists of people making announcements and/or shouting at each other, without any particular voice or wit to the dialogue. It’s just empty confrontation; the filmmakers hold to steadily to the conflict = drama formula (pushed by Carlo Giacco’s melodramatic score). The scenes bump into each other like gridlocked traffic, not going anywhere, and when all else fails, they do a music montage (including one of Neil settling in to his new home, which is accompanied by, I kid you not, John Denver’s “Thank God I’m a Country Boy”). There’s no one in it to engage with—Famiglietti is, for much of the film, an empty vessel, and the characters surrounding him are mostly unlikable stereotypes. That said, Neil becomes a more interesting character as the picture wears on, finally impressing with a unique presence and believability. Eric Leffler, as the friendly neighbor who sells him the land, is also a laid-back, natural presence. The best performer in the film, however is Miriam Shor, an actor best known for her copious TV work. She pops early in a brief scene as a waitress, and is so good we spend the next 20 minutes waiting for the movie to get back to her. Unfortunately, when they do, it’s for an uninspired romantic subplot that barely gets going before it’s over (but does including a cringe-inducing run-up to a love scene with lines that even this talented actor can’t sell). Their relationship is barely a hiccup; she’s turned into some kind of horrible person with no motivation or warning, merely at the convenience of the plot. I will give Lbs. this—the third act is better than the first two, and the physical transformations of not only Famigletti but Michael Aronov as his drug addict friend are pretty remarkable. But for all of the potential offered by the situation, they end up honing in on obvious payoffs (I’m thinking particularly of his dinner date with an old crush) and murky storytelling (is his behavior in the hotel a pattern, or a one-time thing?). Again, it breaks my heart to have such mean things to say about such a (mostly) well-intentioned project. Lbs. is clearly a labor of love. But that’s just not good enough. "Lbs." opens Friday, March 26 in limited release.